Key Difference: The main difference between coffee beans and cocoa beans is that coffee beans are used to make coffee, which cocoa beans help produce chocolate in its many varieties. The main difference between coffee beans and cocoa beans is that coffee beans are used to make coffee, which cocoa beans help produce chocolate in its many varieties. Fun fact, the coffee bean is not a bean at all. It is in fact a seed, gotten from the coffee fruit. The fruit resembles a cherry and the ‘coffee bean’ is often called the pit of the coffee fruit. The fruit of the coffee plant is harvested, and the pits removed. The pits are then cleaned and roasted. This is what is sold in the market as Coffee Beans. The pits are actually green in color and change to brown when they are roasted. They can be roasted to different strengths, from mild to dark, each giving the beans a different flavor. They are also at time additionally flavored, such as Vanilla Roast, etc. While there are dozens of different species of coffee plants, most of the world’s coffee comes from two: Coffea Arabica and Coffea canephora. In order to be brewed, these roasted beans then have to be grounded. The resulting powder can then be brewed in any manner that the drinker prefers: French press, espresso, hot drip, cold press, etc. The liquid can then be drunk as is, or with the addition of milk, sugar, or other flavorings, such as vanilla, cinnamon, caramel, or even mocha, among others. According to popular legend, the coffee plant was first discovered in Ethiopia by a goatherd named Kaldi. However, according to authenticated accounts, the plant was found in the mountains of Yemen and was then exported around the world by 1500 CE. In comparison, the cocoa beans are much older than that. Evidence suggests that chocolate beverages have been drunk dating back to 1900 BCE, that is almost 4000 years. It is believed to be originally drunk by the Mokaya cultures of Mexico and Guatemala, but has been cultivated and drunk by other cultures for at least the last 3000 years. Cocoa beans come from the Theobroma cacao plant. The beans or seeds are located in a large pod that grows directly from the trunk of the tree. The pod must first be cut and fleshy part of the pod extracted. This fleshy part is the actual fruit and is edible. The seeds are actually covered by this fleshy part and must be extracted and cleaned through a long and arduous process. The seeds or beans are then roasted, after which they then go on to the process of making chocolate. 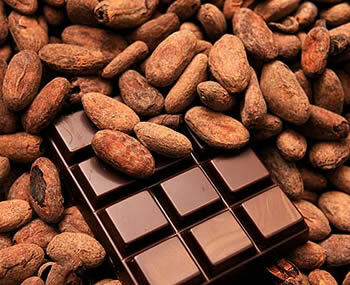 The cocoa and cocoa butter are separated from the seeds and used in various concentrations and through various processes to make the various kinds of chocolates. 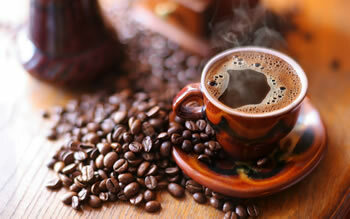 Coffee Beans and Cocoa Beans are two different types of seeds that result in two different products. The coffee bean itself is smaller in size than the cocoa beans and is shaped somewhat like a raisin. The cocoa bean, on the other hand, is larger in size and is similar in shape to the traditional beans, such as kidney bean or the common bean. Also, while there is only one coffee bean in each of the coffee fruit, the cocoa beans come in a pod which contains several seeds, all of which are covered in the fleshy part of the fruit. Coffee beans also tend to contain a lot more caffeine than the cocoa beans, whereas the cocoa beans tend to be higher in antioxidants such as procyanidins and flavonoids, which have various health benefits and mood boosting capabilities. However, cocoa beans also tend to be high in calories, a fact that translates over to the chocolate it produces. Coffee beans have so few calories that it practically counts as none. Coffee drinks tend to have a lot of calories, but these are from added flavorings, such as milk, sugar, and other flavorings. Low in Calories. Most of the Calories come from the addition to the coffee such as milk, sugar, and other flavors. Middle Easterners are big coffee drinkers. Tea mainly only in countries with a history of British colonisation. Great coffee throughout the ME. "It has become essential to live for almost everyone" Are you serious?